Target Madagascar looks at energy in this edition, and travels west to the country’s first-ever oil production facility, now onstream. There is enormous potential here, with estimated reserves of nearly two billion barrels. And not just any oil, the highly sought-after “sweet” heavy variety that also happens to be low in impurities and easier to refine. “We produce heavy oil here in Tsimiroro where we have tanks that can store 160,000 barrels,” says petroleum engineer Mbola Andriamalala. 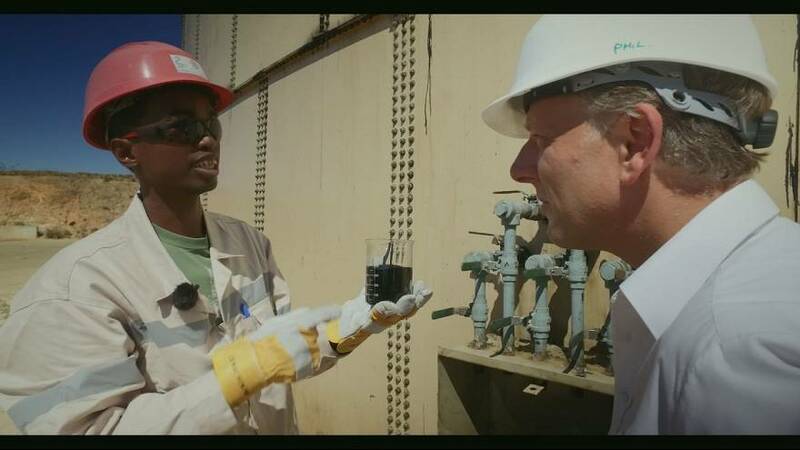 “This oil is very suitable for powering Madagascar. So, very soon, some of that oil is going to find its way here as fuel for power generation, and we hope eventually that will expand into other industrial fuels,” says Madagascar Oil boss John Claussen. Two hundred and sixty seven million euros of private capital have been sunk into the project, and 90 percent of the workforce is local. Apart from making serious environmental commitments, the company has built schools and health infrastructure throughout the region. The oil will soon be firing the main power station in the capital Antananarivo. “We will be transporting the fuel within Madagascar by road. And it’s an opportunity really to help the whole infrastructure. We will be doing part of that to help with our trucks, but as well there will be other opportunities that will come as the infrastructure grows and as the development grows here as well,” assures Claussen. New investments could also follow linked to the growth of the project. There is talk of building a pipeline, or a port on the island’s west coast. “Developing sites like this one could entirely transform the economy of Madagascar, so investors need to know about the vast potential that awaits them here,” reports euronews’ Serge Rombi. Exploration has been intensive. It is now known that Madagascar has five sedimentary basins that look highly promising for hydrocarbons. A vast deposit of natural gas has recently been discovered in the south. As far as oil goes, new blocs to be auctioned off for exploration have been prospected. “We think that Madagascar has a total geological reserve of about 1,500 billion barrels of oil,” says Omnis General Manager Bonaventure Rasoanaivo. To encourage investors the authorities have promised to reform oil industry laws, and to encourage exploration companies are offered a VAT holiday until any is found. “Next year year Madagascar will launch an international tender to investors for 40 offshore blocs, and three to four onshore ones,” adds Rasoanaivo. Obviously the objective is to boost economic development but also to achieve energy independence via Madagascar’s considerable energy resources, until now under-exploited.